One of the best perennials for your garden in the Hudson Valley. 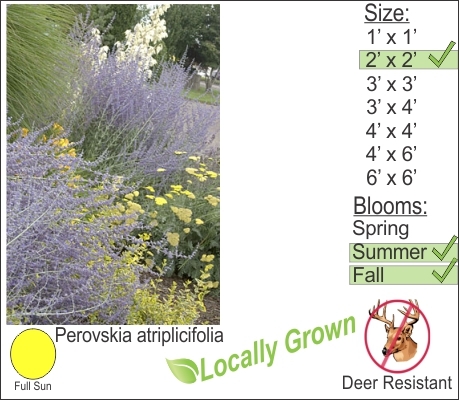 Russian sage combines beautiful purple flowers throughout the summer with excellent deer resistance. This winter hardy perennial features graceful silvery branching that stands out form the crowd of green shrubs in the landscape. In spring this perennial may need to be cut back only partially. Prune Russian Sage and leave 12-15 inches of the plant intact. Many times the lower portion of this perennial will sprout and it is unnecessary to cut it to the ground.